You can now buy six unusual greetings cards drawn by the satirical artist William Heath Robinson, famous for his funny contraptions and ingenious solutions to common problems. We are making them available exclusively through our website. They are not in the shops. Heath Robinson has some novel solutions to age-old problems. If you’d like more kisses on your birthday, why not go into an old people’s home? If you crave a good night’s sleep, set up a winch and wind the baby out of the window. The quirky and charming scenes we have chosen celebrate rites of passage both major and minor, from Birthday, St Valentine’s Day and Wedding through to New Baby, Good Luck and Christmas. Though warm and compassionate by nature, Heath Robinson couldn’t resist a sly dig at conventions and was not entirely displeased to find himself associated in some people’s minds with ‘sick humour’. 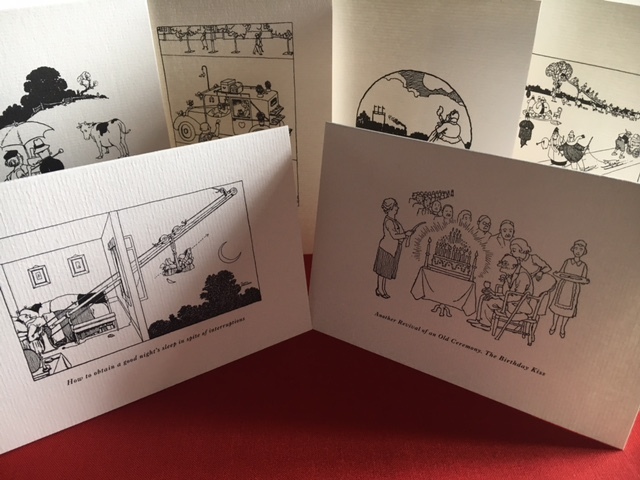 We made these cards as rewards for our Kickstarter backers when raising funds to complete Adam Hart-Davis’s whopping new book, Very Heath Robinson, published on 4th May. You can now order them individually or as a set of six whenever you need to mark life events. If you are looking for an unusual idea, plunder the cabinet of curiosities that is Heath Robinson’s imagination. To be entertained, touched or slightly shocked, see Heath Robinson Greetings Cards.